"Bobby van" is also British slang for a Police van. Robert Jack Stein, better known by his stage name Bobby Van (December 6, 1928 – July 31, 1980) was a musical actor, best known for his career on Broadway in the 1950s and 1970s. He was also a game show host. 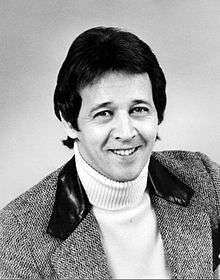 Bobby Van was born Robert Jack Stein to vaudeville parents in The Bronx, New York City, and grew up backstage, witnessing many memorable Depression-era acts. Originally, Van took King as his stage name (after his father's stage name, from the trio "Gordon, Reed and King"). He finally opted for Van, supposedly after seeing a Van Johnson poster hanging in his sister's bedroom. Van began his career as a musician, playing trumpet. When his band played a venue in the Catskills,  Van was asked to fill in as a song and dance man for another act. His act drew rave reviews and gave Van a thrill performing live as a solo act. He went on to appear in the Broadway musical Alive and Kicking in 1950, and also appeared in the revival of On Your Toes in 1954. In the early 1950s, while Van was married to starlet Diane Garrett, he received a contract with Metro-Goldwyn-Mayer and appeared in several films including the title role in The Affairs of Dobie Gillis in 1953 and roles in the musicals Because You're Mine and Kiss Me, Kate. Hal Erickson noted that "Van will always be remembered as the ecstatic young fellow who made like a human pogo stick during an expansive production number in Small Town Girl (1953)." In the 1960s, Van did comedy work with Mickey Rooney in films and television. He appeared in three episodes of Rooney's Mickey sitcom on ABC in the role of a freeloading brother-in-law. He also did some choreography, as had his father years earlier. In 1968, Van married Broadway actress Elaine Joyce, and together they appeared on 1970s game shows like Tattletales and Match Game. Van also hosted the game shows Showoffs, The Fun Factory and Make Me Laugh. They had one daughter, Taylor, who was born in 1977. Van starred in the 1971 Broadway revival of No, No, Nanette, for which he was nominated for a Tony Award. In 1973 he appeared in the musical remake of Lost Horizon, the last occasion on which he took his traditional song-and-dance persona to the big screen. His novelty dance number from Small Town Girl (1953) was featured in That's Entertainment, Part II (1976). In 1978, he played swindler Warren Custer in the episode "The Two-Million-Dollar Stowaway" of the NBC crime drama series The Eddie Capra Mysteries. In 1979, he appeared in the original Battlestar Galactica episode "Greetings from Earth" as the robot Hector, working along veteran song and dance man Ray Bolger (Vector). Van also hosted a syndicated revival of the game show, Make Me Laugh during the 1979–80 season. In June 1977 he appeared in the musical Anything Goes as "Billy Crocker" at the Kenley Players in Dayton, Ohio. In 1979, Van was diagnosed with a malignant brain tumor. He survived the initial surgery, but after a year-long battle with cancer, he died from the disease in Los Angeles in 1980 and his remains were interred at Mount Sinai Memorial Park Cemetery, a Jewish cemetery, in Los Angeles. Wikimedia Commons has media related to Bobby Van.